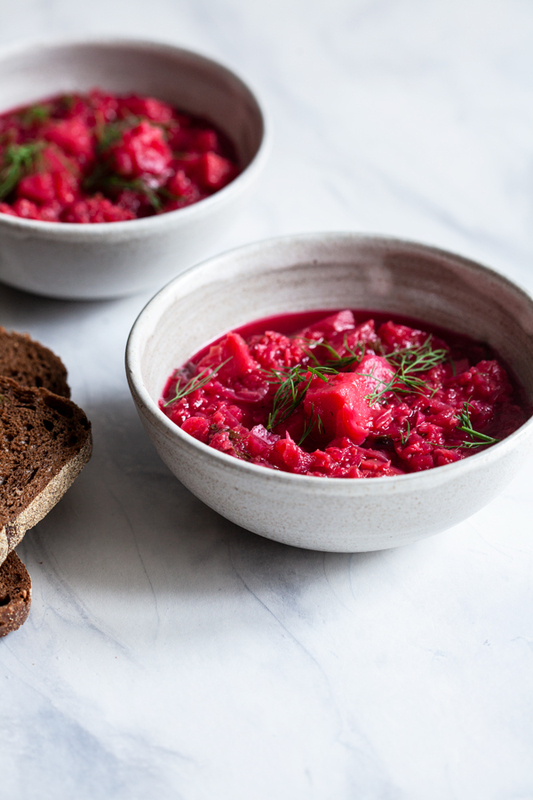 It seems a funny time for me to be making borscht, which is often thought of as a winter soup, but when I passed the farmer’s market last Saturday it was teeming with beets and cabbage. I picked up both before I knew what I’d do with them. There’s a story at the start of Anya Kassoff’s beautiful new cookbook, Simply Vibrant. The main character is Anya’s grandfather, Aleksei Gerasimovich Golub, a shoemaker who was born in the North Caucasus before the Russian Revolution of 1917. One of the fables he passed along to his grandkids involved a long ago, early morning trek through the streets of Blagodatny. Aleksei was nursing a hangover from the previous evening’s festivities, and he suffered under a rising summer sun. Aleksei paid a visit to an acquaintance who lived along the route to work, secretly hoping that this hospitable friend would offer him a drink of cold milk. The friend—Pyotr Vasilevich—did just that. Aleksei refused once, partaking in a custom in which it was polite for a guest to refuse offerings of food or drink initially and for a host to then insist. Pyotr insisted in keeping with the custom, but Aleksei was hit with what Anya calls “a stubborn, Slavic politeness that often overcame him” and refused a second time. He expected a another offer, but it never came, and so he trekked back out into the heat, parched and unsatisfied. 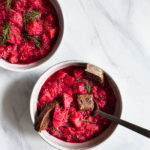 This is all my very roundabout way of saying that, even if Anya lists the borscht as a winter recipe (one of the nice features of her new cookbook is that recipes are marked by season), it felt like a fulfillment of her invitation to seize chances to use my beets and cabbage in this beautifully colored, delicious soup. I didn’t review Anya’s first cookbook, The Vibrant Table, on my blog, but it’s one of the most creative plant-based cookbooks I’ve come across, and her blog, Golubka Kitchen, is a favorite. Anya’s recipes are always playful and nourishing, but what I think love most about them is their color. They’re always a joy to look at: fresh, bright, and vibrant indeed. Simply Vibrant is tribute to seasonal cooking, but it shares the qualities that I love about Anya’s other books: thoughtful recipes, an emphasis on whole foods and cooking from scratch, and a sense of connection to tradition. 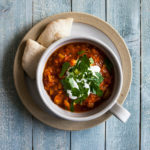 Anya often interjects stories about her family and her roots into her headnotes, and she offers up many recipes that are or have been inspired by traditional Russian fare. Reading her blog and books, I feel as though I’ve been transported to a kitchen in which many generations of people have prepared food with love. As someone who doesn’t have a strong family food history, it feels like a treat to be invited into Anya’s home. 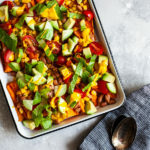 When I first read the recipe, it seemed as though it demanded a lot of slow simmering and layering, and even though school’s out I wasn’t sure about the time involved. I often take liberties with cookbook recipes, but I follow Ina Garten’s suggestion of always making a recipe exactly as written, or close to it, the first time I make it. That way I know what it’s supposed to taste like, and I get a sense of what each ingredient and step contributes. I’m so glad I made the recipe as Anya relays it, rather than taking shortcuts. 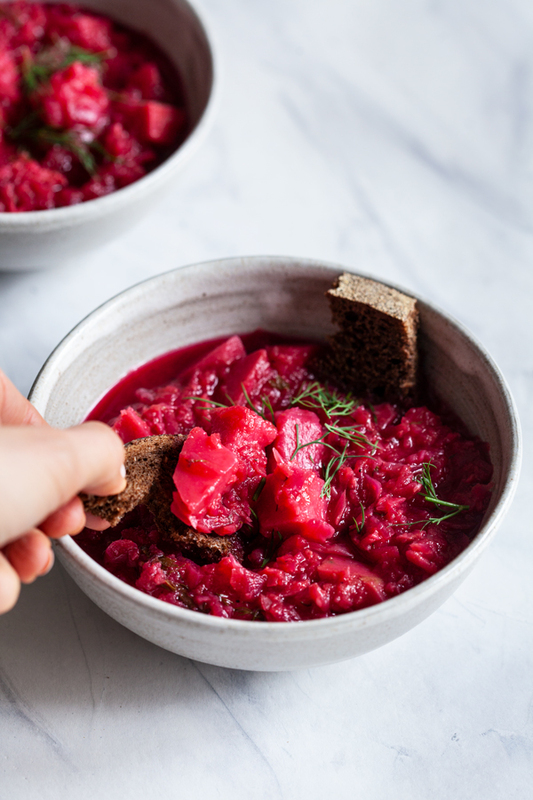 She notes that her mom’s way of “gently steeping a gigantic amount of various vegetables in their own juices gives this vegetarian borscht irresistable flavor,” and she’s right: not only is it incredibly flavorful, but it’s better if you let it sit for a day before eating. Allowing the flavors to meld makes a huge difference. Anya claims to have a very intuitive approach to cooking, so while I wanted to be faithful to her technique, I did throw in my own small flourish, which was a big splash of red wine vinegar at the end. I love acid, and even though the tomatoes contribute some of their own, I thought it brought out even more flavor from the soup. I served mine with old-fashioned pumpernickel bread (both on the side and ripped into rustic croutons), but I love Anya’s suggestion to stir in something creamy (vegan sour cream, cashew cream, or yogurt would all be great). Peel the carrots, parsnips, beet, onion, and celery root, if using, and remove the seeds from the bell peppers and jalapeño. Roughly chop all the vegetables to fit into the feeding tube of a food processor with a shredding attachment. Shred all the vegetables and transfer the mixture to a large, heavy-bottomed soup pot. Add the oil to the pot and season to taste with salt and pepper. 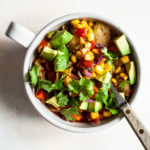 Turn the heat to medium and let the vegetable juices release and start simmering, then reduce the heat to low, cover the pot, and let the vegetables cook gently in their juices for 30 minutes, until all the juices are released and the vegetables are soft. Meanwhile, change the food processor attachment to a slicer. Roughly chop the cabbage to fit into the food processor's feeding tube, and slice it using the attachment. Alternatively, thinly slice the cabbage by hand. Transfer the cabbage to a large bowl and cover it with cold water; set aside. After the shredded vegetables have cooked for 30 minutes, place the potatoes on top and pour in enough water to cover the potatoes completely. Increase the heat to medium, bring the liquid to a boil, then reduce the heat to a simmer and cook, partially covered, for about 10 minutes, until the potatoes are soft. Meanwhile, bring a kettle or medium saucepan of water to a boil. Drain the cabbage and add it to the pot with the potatoes and shredded vegetables. Pour the boiling water over the cabbage, filling the pot but leaving some room for the tomatoes. Add a few big pinches of salt. Simmer for 15 to 20 minutes or until the cabbage is soft, then add the crushed tomatoes and bring the soup back to a boil over medium heat. Taste for salt and adjust if needed. As soon as the soup comes to a boil, remove the pot from the heat and stir in the garlic and herbs. 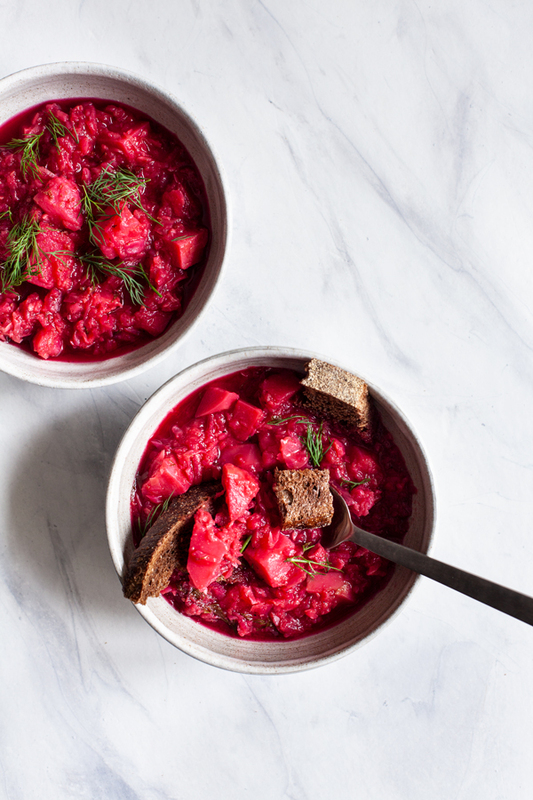 For best results, let the borscht come to room temperature and then refrigerate it overnight so it can develop fully in flavor. When you're ready to serve it, reheat the borscht on the stove. Serve with sour cream and more chopped dill and parsley, if desired. Other recipes in the book are similar to this one in that they might involve a stepwise process, but it’s not random: if different vegetables are cooked separately, for instance, it’s so that each kind is perfectly tender, rather than over or undercooked. 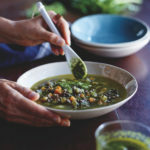 Many of the remaining recipes are incredibly simple, including the salads and bowls, the basics, and the vegetable sides. The book also includes a whole chapter of porridges and pancakes (my kind of breakfasts! ), wraps and rolls, risotto, paella, and pilaf, and noodles, pasta, and pizza. 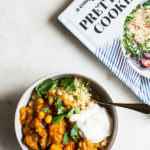 There are so many things I’m eager to try that I don’t know where to start, but I’m keen on the Bukhara Farro Filaf (a spin on plov), the spelt fettuccine with melted rainbow chard, the chickpea and kohlrabi salad wraps, and the couscous stuffed collard greens in coconut curry sauce. The book isn’t all vegan, but it’s very predominantly plant-based, and most of the recipes can be veganized with non-dairy substitutions if they aren’t vegan already. I’d love for one US reader of this blog to have a copy of Anya’s bright and bold tribute to seasonal fare! Enter below for a chance to win a giveaway of Simply Vibrant; as usual, I’ll pick a winner in two weeks. It’s been a big week around here, so I’m winding down slowly and intentionally, grateful that it’s now Friday and a weekend is on the way. I’ll see you for Sunday’s roundup. Beets are definitely my favorite colorful veggie — so this is a fitting recipe! Thank you for sharing. I’ve been loving the golden summer squash, it’s such a bright gold color it almost looks unreal. I picked my first two from the garden and used them yesterday. carrots – perhaps simple but so versatile. I love cooking with any kind of squash! I haven’t yet checked out this book, but can never get enough of the beautiful photos on Anya’s site. I imagine this book, when I finally get my hands on it, will be just as colorful and inspiring! 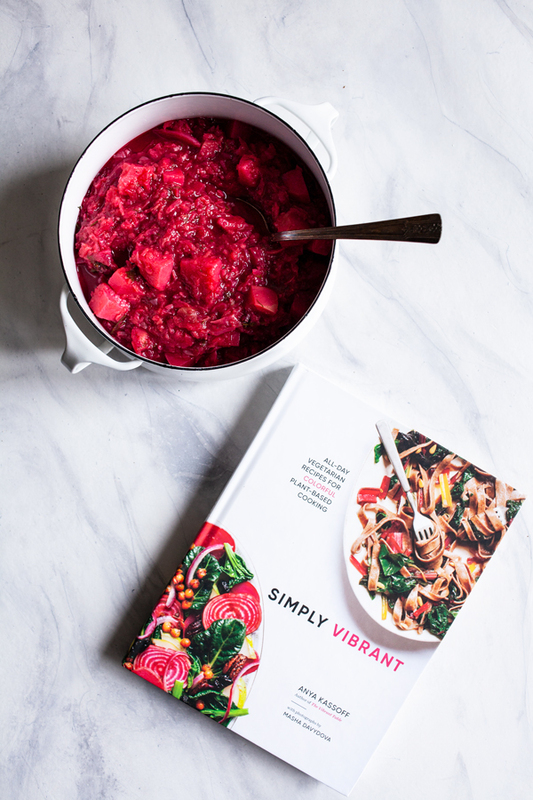 My favorite colorful veggie to cook with is actually beets! I just love love the color they add to everything (maybe not so much my hands lol.) I actually do make my own version of borscht, can’t wait to try Anya’s. I love the idea of adding parsnips, I’ve never heard of anyone do this and I was actually raised on borscht. Orange is my fave food color to cook with! Love these giveaways–to learn about and lust for new cookbooks! Love BEETS! Love the color! This inspires me to try something new with beets. Thank you. I have to say — borscht has never appealed to me, but the rainbow of vegetables and herbs incorporated into this version has changed my mind. It looks fabulous! I’m planning on making it this week with a swirl of coconut cream to finish. Thank you for featuring! I loved reading that story. Thank you for sharing it. It definitely resonates with me. I love cooking seasonally, not just for the conveniently cheaper produce but the flavors are so much more grand! The colors in this soup are so bright and cheery–very cheery for a winter day but completely fitting for a nice spring day too. Beautiful post! I love cooking with kimchi. 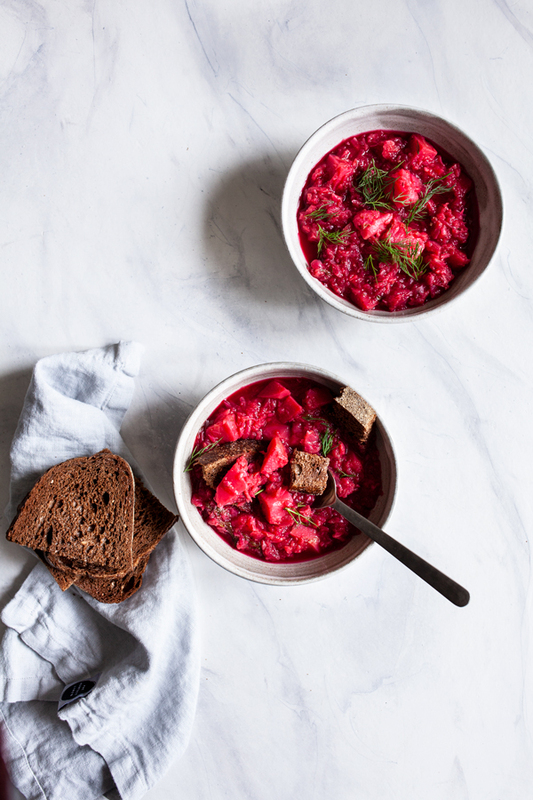 This soup is so beautiful as red is my favourite color, the beet absolutely rocks it! Now that spring is here, I love cooking with bright green asparagus! Beets are the best colorful veggie — just made pink pasta this weekend! Looks really yummy! My favorite vegetable to cook with is sweet potatoes. Cooking with eggplant. It is so vibrant.